Uttarakhand is a state in the northern part of India. 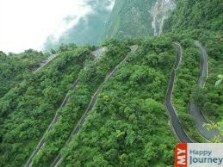 It is known for its scenic beauty and shares its borders with Himachal Pradesh, Uttar Pradesh, Tibet and Nepal. The state is divided mainly into two divisions: Garhwal and Kumaon and comprises of a total of 13 districts. Dehradun, the largest city of the state is the capital of Uttarakhand. A number of Hindu pilgrimage centers and the famous hill station Nainital are also located in this northern state. Population wise this state is the 19th most populous state of the Indian sub continent. Uttarakhand has a rich flora as well as fauna; it is covered with all types of forests. So you get to see vegetation of a wide variety. Rich flora invites wildlife and helps in their growth as well as longevity. Due to this fact we can see a huge number of species including bird species, animal species, reptiles etc. These special features make this northern state an important tourist destination. People from all over the country visit Uttarakhand and enjoy its beauty. Summer season in Uttarakhand is extremely hot with temperature touching a high of 40 degree Celsius with good amount of humidity in the atmosphere, winters are quite cold and a low temperature of 5 degree Celsius is recorded. The climate at the higher places of Uttarakhand is cool in summer and extremely cold in winter. Some famous tourist attractions of Uttarakhand are Berinag, Abbot Mount, and Asan Barage, Baijnath, Kathgodam, Hemkund Sahib, Lohag hat, Ranikhet, Bharkot, Kalpeshwar, Nainital, Kathgodam, Adi Kailash, Berinag, Almora, Haridwar, and various others.